As you may know, HTC is rolling out a new series of diamond tooling, the SMHX series, which simplifies the process of determining the best tools for your concrete floor. 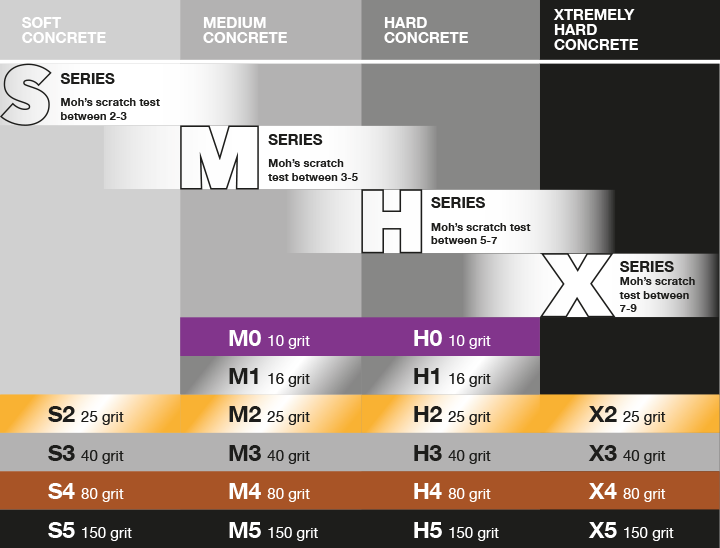 For instance, instead of identifying that you must use soft bond diamonds on a hard concrete surface, now all you need to know is that the H Series is designed specifically for hard concrete. The SMHX series is straightforward and easy to understand, with overlapping areas of use for greater flexibility and longer life. See the chart below for more clarification. The H series is already out; it was the first series launched. It replaces the SF series. The S and M series will be out soon as well. The S series is replacing the C series and the M series is replacing the CA series. And finally, the X series will be out later in the year (4th quarter) and will replace the CX series. If you have more questions about this, please contact us via our website or in the comment section below. We want you to make the transition easily, so your understanding is our first priority. This entry was posted in Featured Products, Industry Trends and tagged concrete polishing, diamond tooling, grinder tooling, HTC, HTC diamond tooling, HTC Floor Systems, Polished concrete, SMHX series. Bookmark the permalink.